North West England: Artists and Subjects, Scotland: Artists and Subjects, British 19th C, except portraits 18 comments Is this by James Wilson Mackenzie? Liverpool Autumn Exhibition 1883 no. 557 was 'Mending the Sails' by J. W. Mackenzie, priced at 18 guineas. There are two works by James Wilson Mackenzie on Art UK, both of which were gifts from the artist’s mother: ‘On Duty, portrait of “Old Bibby”’, 1890, Atkinson Art Gallery Collection, Southport, and ‘Sunny Day at Bebington Windmill, Wirral’, Williamson Art Gallery and Museum, Oxton, Wirral. Study of a fisherman attributed to James Wilson Mackenzie. Art UK records Mackenzie as active 1881–1890; Getty ULAN lists him as active 1888–1890; ‘The Dictionary of British Artists 1880–1940’ lists him as a portrait and figure painter working in Liverpool, exhibiting 1882–1892 at Glasgow Institute of the Fine Arts (2 works), Walker Art Gallery, Liverpool (33), Manchester City Art Gallery (3), the Royal Academy (3) and the Royal Scottish Academy (3). Can more be found out about ‘Ross’ (mentioned on two labels) in the process? James Wilson Mackenzie appears to have lived into the 20th century. His works have been offered at auction in 1994 and 2018 in the UK. One was titled 'Resting in the Shade' dated 1888. There is also a James Wilson McKenzie (no "a" in the surname) who may or may not be the same painter. Could "Ross" refer to the Ross-shire area in northern Scotland? Could that be where the depicted scene takes place? The earlier exhibition catalogues list this artist as "J. Wilson MacKenzie", perhaps suggesting the use of a double surname - together with the possible variable spelling of Mac/McKenzie, there is some potential for confusion! 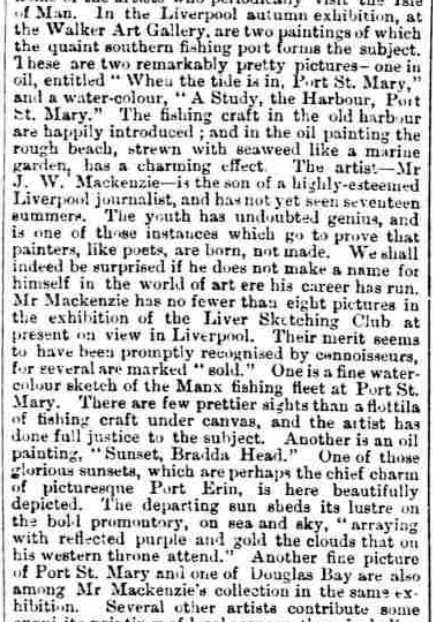 Attached are two poignant newspaper articles regarding the artist James Wilson Mackenzie (1865 - 1893). His father, James B. Mackenzie, was the chief reporter for the Liverpool Mercury in 1881. Census records for 1871 and 1881 describe him as being completely deaf and dumb, and a search for "J. Wilson Mackenzie" and "Wilson Mackenzie" on the BNA shows many references to him from 1881 until his death. He was the eldest of several children and a younger brother, George, also an artist, was (in the 1881 census) described as semi-deaf and dumb. James contributed regularly at the Liverpool art exhibitions and, from an address at 28, Falkner Street, Liverpool, also had one work accepted at the RA in each of the years 1888, 1889 and 1890. He also is reported to have won several bronze and silver medals for his paintings and drawings at various exhibitions. In 1890, he led a delegation of fellow deaf and dumb Liverpudlians to Paris. He was described thus: "...to which a party of a dozen youths went from Liverpool, headed by J. Wilson Mackenzie, also deaf and dumb, whose high reputation as an artist in this city shows what eminence can be attained even under such a serious drawback." The various newspaper reports mention that the subjects of his work include fishermen, smithys, old villagers, etc., themes in keeping with this discussion's subject. Mackenzie seems to have spent much time on the Isle of Man and the Ross referred to might have something to do with Ross Bay, 27 miles north of there, in Scotland. The connection to Scotland might come from the fact that his father was Scottish. The notion of him sailing from Liverpool to the Isle of Man and onward to Scotland is not unreasonable, especially as many of his reported subjects relate to the fishing industry and to picturesque bays. 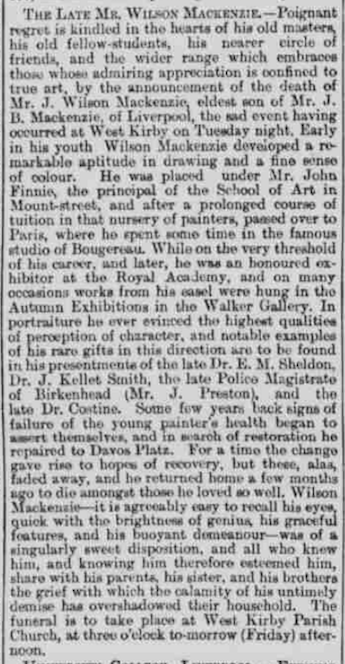 Due to failing health, he spent some time in Switzerland, as is mentioned in the newspaper cuttings. He died before he reached the age of 30. "Mackenzie / Annand - September 28th, at Lintrathen, Forfarshire, buy the Rev. Charles Chree, Mr. James B. Mackenzie, of this town (Liverpool), to Mary, only daughter of the late Mr. Thomas Annand, merchant, Alyth." Alyth is in the region of Lintrathen, which is located north of Dundee. "MacKenzie - September 18th, at 37, Harewood Street, Everton, the wife, of Mr. James B. MacKenzie, of a son"
James Brander Mackenzie, the artist's father, died at Falkner Street, Liverpool, on the 25th April 1904, leaving his wife, Mary Douglas Mackenzie (neé Annand), and the sum of £895. The attribution to Mackenzie is perfectly plausible, but what was the basis of the original connection made between him and this picture? Was it simply that someone who knew the painting was reminded of it by running across a fitting title in an old exhibition catalogue? As I expect other collections have found, Martin Hopkinson (who started this) does see old catalogues and usefully -and directly if he has a personal contact - suggests potential tie-ups between titles in them and known pictures. This looks like another such, but seeking wider opinion, and looks a good basis for an attribution. The odd man out in the original list of Mackenzie pictures he provided is the‘Sunny Day at Bebington Windmill, Wirral’, at the Williamson Art Gallery: its so different to Mackenzie's apparently usual subject and manner as to suggest a recording error somewhere. 'Sunny Day at Bebington Windmill, Wirral' could be signed lower left (cut off in the PCF photograph?). I will ask the collection if they could kindly take a look. I also noted the apparent discrepancy between the figure subjects and the Wirral landscape, but since both Mackenzies listed on ArtUK were reportedly donated by the artist's mother, I opted not to question their authorship. However, if the landscape is signed, that should certainly be pursued for confirmation. The Wirral landscape looks more French, but if (as Kieran found) Mackenzie visited Paris in 1890, it may reflect the effect of what he saw there. The painting is in another building so there will be a delay before I can get to it and check the signature, I'm afraid. Williamson Art Gallery & Museum, thank you very much for offering to check the signature. We look forward to hearing from you in due course. Returning to the original topic, Kieran's suggestion of Ross in Dumfries and Galloway as the locality for the painting is plausible. The net hanging in the window may be a shrimp net, and shrimp trawling was very active in the Solway Firth at that time. Also, there was a thriving art scene centred in Kikcudbright, which might have attracted MacKenzie to the area. Of the labels mentioned above, are there photos available to see? This discussion has been removed from the group 'Portraits: British 19th C' and linked instead to 'British 19th C, except Portraits'.